Until the past year or so, Vermont’s organic milk producers defied the laws of dairy-farm economics: They actually made money. Sales of organic milk soared 20 percent nationwide in 2008 as an increasing number of shoppers put environmental and health concerns ahead of personal financial calculations. They were willing to pay more than twice as much for organic milk as for the conventional kind. Then the recession hit, shrinking demand for the organic product, which sells for $4.79 a half-gallon at City Market in Burlington compared with $1.99 for the same quantity of conventional milk. City Market’s sales of Organic Valley half-gallons nosedived in April — from 830 units the previous year to 273, reports Marketing Manager Nicole Fenton. In May, she adds, the same product flew off the shelves — but it was marked down 25 percent. In Middlebury, the Natural Foods Co-op has recorded only a slight decrease in organic milk sales — a result that corresponds closely to the national figures. The U.S. Department of Agriculture reported monthly declines of organic whole milk sales in January and February of 3.6 and 1.4 percent, respectively. March actually saw a 3 percent increase over the previous year. Despite economic insecurities, many consumers, such as Judy Line of Burlington, remain committed to buying organic. Placing a half-gallon of Strafford Organic Creamery milk in her City Market shopping cart last Monday, Line explained that she seeks to support Vermont farmers, prefers glass containers to plastic, and thinks organic milk tastes better. “I’m cutting back on some stuff, like going to the movies, but not on organic milk or produce,” Line said. Many consumers less resolute than Line have taken the cheaper option, and the result is a swell in the supply of organic milk, which was already rising as an increasing number of dairy farmers made the transition out of conventional production. The prospect of surpluses has motivated the leading processor of organic milk, Wisconsin-based Organic Valley, to cut their purchases from farmers by 7 percent. The aim is to keep supply in rough equilibrium with demand, thereby stabilizing the price. It’s similar to what oil-producing nations try to do with global prices for their commodity. Organic Valley, a producers’ co-op, pays its farmer-members about $30 per hundredweight of milk. A conventional dairy farmer in Vermont can expect to receive about $12 per hundredweight. But a 7 percent drop in milk orders amounts to a 7 percent drop in revenues, which “could be catastrophic” for some organic dairy farmers, says John Cleary, New England dairy coordinator for Organic Valley. Cleary estimates that about two-thirds of Vermont organic dairy herders are still making money, while the remainder are generally at least managing to pay their bills. Margins can be straw thin, however. J.D. and Cheryl de Vos made money the first few years after shifting from conventional to organic milk production at their North Ferrisburgh farm in 2005. Now they’re losing about $12,000 a month, Cheryl figures. “It’s been a tough year,” adds Lori Choiniere, an organic dairy farmer in Highgate. She notes that her family’s third-generation farm is larded with debt taken on during the years when it used chemical fertilizers. Still, none of Vermont’s roughly 200 organic dairy farms have gone out of business — in conspicuous contrast to the demise of 36 conventional cow operations in the first six months of this year. And struggling organic farmers such as de Vos and Choiniere are optimistic about returning to profitability. J.D. de Vos also thinks better times are coming, but he could be an inveterate optimist. De Vos made his prediction from a face-down position in a massage chair, a posture his doctors say will help his left eye heal after three recent rounds of surgery. In a bloody reminder of the daily dangers that farming entails, a strand of wire sprang loose and slashed de Vos’ eye as he was mending a fence early last month. Even if the recession continues to crimp his ambitions, de Vos says he has no regrets about going organic. The 550-acre spread he shares with his father previously saw the use of a bovine growth hormone known as BST, as well as other hormones that make lactation cycles more efficient. “Getting away from that was far and away the best thing we’ve ever done,” says de Vos, who recalls being initially skeptical about abandoning conventional techniques. “This way it’s just better for the planet,” says Cheryl de Vos, who initiated dinner-table talk about going organic after attending a NOFA workshop in 2003. It’s also better for the cows, she finds. The farm’s 180 milkers produce less milk than they did when they were boosted with BST, but they don’t sicken as often, and they remain productive longer, de Vos notes. Another key factor may be that the Beidlers raise about 80 percent of the feed consumed by their 35 Jerseys and Holsteins. Organic feed is one expense that makes it much costlier to produce organic than conventional milk. 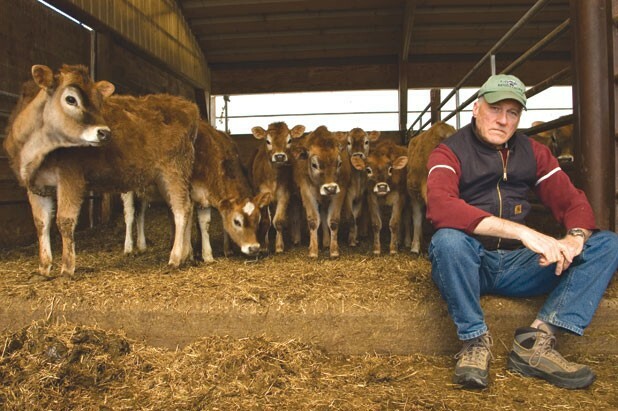 According to estimates by the Cattle Network national news service, production costs for Vermont organic dairy farmers range from $30 to $32 per hundredweight of milk that their cows provide. The corresponding figure for Vermont’s conventional dairy producers is $25. Based on these numbers, the Cattle Network computes that Vermont organic dairy farmers are losing, on average, $4 per hundredweight, while conventional milk producers in the state are suffering a calamitous $13 shortfall. The vast difference between earnings and expenditures accounts for the slow-motion extinction of conventional dairy farming in Vermont. Fifty years ago, there were nearly 9000 dairy farms in the state; the current number approaches the 1000 mark. Even though several more farmers are likely to give up before the year is out, Vermont Agriculture Secretary Roger Albee insists that dairying will remain part of the state’s future. “We’re still going to have dairy farms,” Albee says, noting that Vermont lies within milk-trucking distance of some 60 million consumers. A growing segment of this population is willing to pay more to eat local, Albee points out. Moving to capitalize on that socio-dietary trend, the state’s Ag Agency is launching a “Keep Local Farms” initiative whereby milk drinkers in the Northeast will be given the option of paying a premium price for a container emblazoned with that logo. Ag Agency spokeswoman Kelly Loftus says she doesn’t know what that price will be. She also declined to reveal the identity of “the major retailer” with which the Ag Agency is partnering on this initiative. Loftus does say it could be a chain such as Hannaford, Shaw’s or Price Chopper. The best way to save dairy farms is through a political movement of dairy farmers, suggests NOFA’s Rogers. He has some cred on this matter, having previously worked 28 years in the UVM animal science department as a conventional dairy cow specialist. “Historically, farmers have been price takers,” Rogers says. She’s not alone in holding that view. An organization called Dairy Farmers Working Together is rallying support in Vermont for a supply-management plan intended to stabilize prices at a level that enables milk producers to stay in business. Despite the recession, some analysts regard the economic outlook as favorable for organic dairy farmers in Vermont. “The profit margin can be there for them,” says Glenn Rogers, a regional farm management specialist for the UVM Extension Service. He bases that assessment on a four-year study of Vermont dairy economics that’s now nearing completion. The organic dairy sector is maturing, Rogers finds, pointing to a recent decline in organic grain prices as one indicator. He also expects the retail price of organic milk to slide in the next couple of years, making it more competitive with conventional. Ed Maltby, director of the Northeast Organic Dairy Producers Alliance, expects growth in demand to resume as the recession wanes. “It might not get back to 20 percent a year, but it should reach 10 percent,” he says. Such an uptick should enable organic dairy farmers to earn “reasonable annual incomes,” which Maltby places in the $40,000 to $50,000 range. “They’d be able to buy health insurance for their families and maybe even put a little bit aside for retirement,” he says. Sustained equilibrium of supply and demand would make a huge difference for dairy farmers, both organic and conventional, Maltby adds. Under those elusive circumstances, a conventional dairy farmer could be expected to earn more than an organic producer, he figures, estimating their returns on equity at 5 percent and 2.5 percent, respectively. But government policy makers should not regard comparative profitability as a determinant in deciding whether to encourage organic or conventional production, says James Maroney, owner of a Leicester hay farm and author of The Political Economy of Milk. He calls conventional dairy farming “profligate of the world’s resources.” Reliance on chemical fertilizers “pollutes the world’s lakes and rivers, contributes massively to global warming and still produces no profits for farmers,” Maroney observes. It’s just a matter of time until organic farming supplants conventional, Maroney says, although he demurs from specifying when that time might arrive. Change on this scale doesn’t occur quickly, agrees NOFA’s Rogers. “We’re inventing a whole new way not only of farming but of relating to the Earth — and to each other, for that matter,” he says. The future may arrive first in Vermont, Rogers adds, noting that the state has the highest proportion of organic dairy farms — 20 percent — in the nation. “We live in a very special place that gets it,” he says.